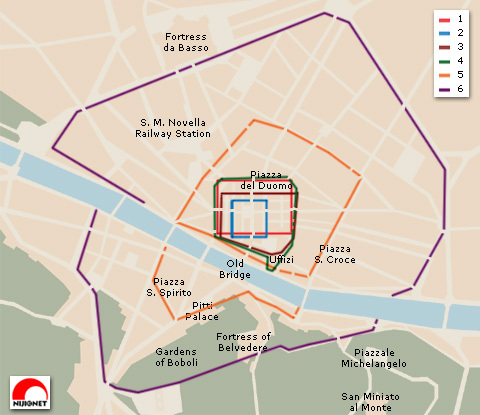 The city walls surrounding Florence have been widened and rebuilt six different times, but only the last two walls protected also the quarters of Oltrarno. Some parts of them are still to be found in the quarters of San Frediano and San Niccolò. The ancient Roman city was founded around 60 B.C. ; it was located in the area between today's Piazza del Duomo and Piazza Santa Trinita and has its fulcrum in today's Piazza della Repubblica, at the crossroads formed by the two main streets, cardo (Via Roma and Via Calimala) and decumanus (Via Strozzi and Via del Corso). In the 2nd Century A.D. Florence counted around 10,000 inhabitants, and was surrounded by a first wall; after the fall of the Western Roman empire the city suffered a deep crisis, so that in 6th Century it counted a mere 1000 inhabitants: a second city wall was then built, protecting a smaller area than the Roman one. Florence flourished then again, and at the beginning of 10th Century the city was surrounded by a wider third wall which for the first time extended itself to the river Arno. The building of the fourth wall was begun in 1078: Florence was a 20,000 inhabitants city and the Duke of Tuscany had moved his capital from Lucca to Florence. The new city walls surrounded also Piazza del Duomo, but the quarters of Oltrarno remained still unprotected. In the years 1173-1175 the city government decided the building of the fifth city wall: for the first time a defence wall was built also in Oltrarno, due to the increasing importance of the dwellings around the churches of San Felice, San Jacopo in Soprarno and Santa Felicita. Three city gates were built in Oltrarno (near today's Piazza San Felice, Costa de' Magnoli and Piazza Frescobaldi), but a real stone wall was not built: the protection consisted of palisades connecting the gates and houses whose outer façades were built without windows in order to offer more protection. A sixth wall was planned since 1284 (possibly under direction of Arnolfo di Cambio). These walls enclosed a very wide area and should protect the whole city with all its newer and outer dwellings. The gates were 35 meters tall, and were decorated with religious frescoes (the Madonna and Saints); originally, on the square in front of each gate was also a statue of a famous Florentine writer or poet. The building of the walls was completed in 1333 - and finally the quarters of Oltrarno received a complete protection. In 16th Century all city gates were pollarded (with exception of the gate of San Niccolò) in order to make them less vulnerable to artillery; when the city prepared itself to face the army of the German empereor Charles V in 1530 new fortifications were added around the Church of San Miniato al Monte. After that, Grand-duke Ferdinando I commissioned Bernardo Buontalenti with the building of a fortress; it was completed in the years 1590-1595 near the gate of San Giorgio and was named Fortress of Santa Maria, but became rapidly known as «Fortress of Belvedere». Between 1865 and 1871 Florence was provisory Capital of Italy: the city walls were demolished in order to build the new ring road. Only the walls in Oltrarno survived, with all their towers. In 1998 a part of the wall between the gate of Porta Romana and Piazza Tasso has been restored and opened to visitors. A view of the accessible city walls facing the gate of Porta Romana. Here the city walls show their original shape, with both towers and merlons: this is how they looked befor the demolition in 19th Century. On the background we can see the tall Gate of San Niccolò. On their southern side the Gardens of Boboli are surrounded by the city walls: a part of them is still recognizable, along with a very tall tower.